On the occasion of the Mass to celebrate 150 years of missionary endeavour in part of Nigeria, Most Rev Anthony Okonkwo Gbuji, Bishop Emeritus of Enugu, was invited to preach. In 1964, the request of Bishop Patrick J Kelly of Benin City to the Holy See to divide his diocese saw the erection of the diocese of Warri. Its first bishop was the Rt Rev Lucas Nwaezeapu (RIP). Nine years later, on 15 July 1973, a second diocese was carved out from Benin City. The mantle of leadership of the fledgling diocese of Issele-Uku was laid on a young priest, Rev Fr Anthony Okonkwo Gbuji. He led the diocese until 8 November 1996 when he was translated to Enugu as bishop, in succession to the Rt Rev Michael Eneje who had retired. Bishop Gbuji was to lead Enugu for over 12 years before his own resignation, having reached the age limit. It was fitting that Bishop Gbuji be asked to preach at the Mass to mark the 150th Anniversary of the arrival of the SMA missionaries in this part of the Lord’s Vineyard. His homily is a treasure throve of information and traces the development of the Church from its beginnings until the present day. Bishop Gbuji worked with many of the pioneer missionaries and knew them well. He also has an unrivalled knowledge of the development of the Catholic Church in this part of Nigeria. His homily should be read by all who have an interest in the history of the Church, and in particular of the SMA, in this part of Nigeria. Bishop Gbuji preached the following homily to the assembled faithful. This morning we heard once again those powerful and captivating words of invitation and mandate from the loving heart of Christ the Redeemer: “FOLLOW ME AND I WILL MAKE YOU INTO FISHERS OF MEN” (Lk. 5:10; Mt. 4: 19). The mission of being fishers of people is addressed not only to Peter, but also to all those who are with Jesus, that is, to all his true followers. 150 years ago the hearts of some generous and gallant disciples were set on fire to carry the message of Good News of salvation to countries and peoples far away from theirs. That fire has blazed the path of salvation throughout many lands in Europe, Africa, Asia, Oceania and the United States of America: Yes! “Their report goes forth through all the earth, their message, to the ends of the world.” (Ps. 19:5). My dear people of God, the story of the Society of African Missions (SMA), is a wonderful success story in the salvation history of the Church. The lives of all of us gathered here today have been deeply touched positively through the proclamation of the good news by the SMA missionaries in different parts of our country Nigeria. For this may the Lord be praised both now and forever. Today indeed is a day of joy; it is a day of prayerful reflection and a day to express our gratitude to God for the abundant blessings on us; and to our dear SMA Fathers and Brothers for their missionary work and in our country, Nigeria. Our heartfelt gratitude similarly goes to the Missionary Sisters of Our Lady of the Apostles (OLA), the twin sisters of the SMA’s, for their effective collaborative ministry in our land. Today, the entire Church, particularly the Church in Ireland and in Nigeria, celebrates the feast of St. Patrick who planted the seed of faith and mission in Ireland in 432 AD, about 1580 years ago. And all of us here like several millions of others, are overjoyed and blessed to join our S.M.A friends to offer today a Mass of Thanksgiving to mark the 150th anniversary of their missionary work in Nigeria. Our joy is overflowing because we are invited also to remember the memory of 425 deceased religious personnel who worked in the Mid West of Nigeria from 1884 – 2011. We are offered the opportunity to pray for their eternal happiness and repose in heaven: Eternal rest grant unto them O Lord…. The early missionary endeavours of the Portuguese and the Spanish in the 15th Century (1472 – 1651) to Nigeria, from all human calculation were a total failure. In February 1856, Cardinal Alessandro Barnabo, the Secretary of the Sacred Congregation of Propaganda Fide asked Bishop de Marion Brésillac to found a missionary congregation to assist him in his new work in West Africa and to ensure stability and continuity. On 8 December 1856, on the hill of Fourviere – at the shrine dedicated to Our Lady in Lyons, France, Bishop de Brésillac and six companions established the Society of African Missions. The special aim of the new Society was the evangelization of the most abandoned people in Africa and the formation of an indigenous clergy to care for the newly-established communities – thus enabling the missionaries to move on to evangelize others who were still in need. In 1858 Rome entrusted the mission of Sierra Leone to the SMA and in the same year, the first three missionaries departed for their new mission. In 1859 Msgr. de Brésillac entrusted the SMA in Europe to Fr. Augustine Planque and set out with two others to join his three confreres in Sierra Leone. On arriving off Freetown they were advised not to go on shore as an epidemic of Yellow Fever was raging in the town, but wanting to be with his missionaries and flock, the bishop and the others disembarked. Twenty-six days later, all the missionaries were dead with the exception of one Brother who returned to France to deliver the sad news. But the saying of the Lord must always come true that: “unless a wheat grain falls on the ground and dies, it remains only a single grain…” (Jn.12:24). Despite such a harrowing loss, the work was destined to continue, and, with the blessing of Pope Pius IX and under the direction of Fr Planque, a new beginning was made. Another group left for Africa in 1861 and a foundation was made in Dahomey (now Benin Republic). Numerous deaths of young priests marked these early years of the Society, yet still it spread quickly throughout the West Coast of Africa. “The first missionaries sent to the people of Africa will not be able to achieve their ends, but thanks to their sacrifice, they will sow an abundant harvest, which their successors will reap”, (wrote one of those early missionaries). By the time of Fr Planque’s death in 1907, there were 296 bishops, priests and brothers, 205 of whom were on the missions in 8 African countries: Dahomey (Benin), Nigeria, Algeria, South Africa, Egypt, Gold Coast (now Ghana), Ivory Coast and Liberia. At this stage more than 130 others had given their lives within a few short years of reaching African soil, then known as the “White man’s grave”. From the beginning, the SMA drew its membership from several countries from which, after the death of Fr Planque, the following Provinces were gradually formed in Ireland (1912), Holland (1923), two in France: Lyons and Est (1927), USA (1941), Great Britain (1968), Italy (1982), and the Districts of Canada (1968) and Spain 1992). Between 1918 and 1992 the Society had also spread to Morocco, Togo, Niger, Democratic Republic of Congo, Zambia, Central African Republic, Tanzania, South Africa, Kenya and Angola. It also opened houses in Australia and Argentina. The SMA presence in Nigeria goes back to 8th September, 1863 when Fr. Francesco Xavier Borghero SMA arrived in Lagos. (Fr Borghero had paid a brief visit to Lagos in March 1862, on his way to Sierra Leone). The elderly SMA Fathers in our midst enjoy to tell the story of how the pioneer priest to Nigeria was subjected to some catechism test before he was accepted as a Catholic priest: “There was a small Catholic Community of Brazilians under the care of a catechist named “Padre” Antonio. He questioned Fr. Borghero, the bearded figure in the white cassock, to know if he were a Catholic priest. One of the questions he asked was to could recite the Rosary. Satisfied with the replies, Fr. Francesco Borghero was accepted. On this occasion fifty nine infants were presented to him for the sacrament of Baptism. One can then understand why till today the SMA Fathers would subject the Nigerian Candidates for the Sacraments of Baptism, Holy Communion and Confirmation to rigorous catechism questions before administering the sacraments to them. Is it a revenge Bishop P.J. Kelly SMA and his SMA Brothers (Confreres) were taking on our people or what? At first the progress of evangelization was slow but gradually the seeds sown began to bear fruit with many of our people blessed with strong faith in Christ; happily, many of us are priests and bishops today. May God bless and reward the SMA most abundantly. We pray O Lord! (1900 – 1910) Shendam – First in Northern Nigeria. (1920 – 1930) Kano, Kaduna and Jos. A spectacular breakthrough in the establishment of the Church in Nigeria by the SMA was the priestly ordination of Rev. Father Paul Obdooechine Emecete, in 1920. It was the first native priest in the entire West Coast of Africa. Thousands of other priests have since followed the footsteps of our pioneer priests. Many of us here today are overjoyed and proud to be counted among them. We are infinitely indebted and very grateful to the SMA Fathers. Another break through that accounted for the huge success of evangelization by the SMA was the establishment of education institutions at all levels. Among their numerous and most outstanding schools and worthy of special mention are: St. Gregory’s Lagos; Loyola College, Ibadan; ICC Benin-City; St. Patrick’s Asaba; St. John’s Kaduna; CMI, Kafanchan and St. Joseph’s Vom; as well as St. Theresa’s minor Seminary, Oke-Are, Ibadan, SS. Peter and Paul, Bodija Ibadan, all founded by SMA priests. During the period of Bishop P. J. Kelly, in Bendel State, more than 75% of all the Secondary Schools in the State were established by the SMA Fathers. This is a record unbeaten in the history of education in many part of Nigeria! Our reflection cannot be complete if we fail to put on record the tremendous growth of the Church in Benin-City Province where the SMA put in their best apostolic mission labour. All of us gathered here are witnesses to their immense sacrifice and successes in evangelization in the entire world mission history. In 1884, the Mission territory of Benin City was carved out of the Vicariate of the Bight of Benin. It was given by Rome to the Society of African Missions (SMA) and the territory was known as the Prefecture Apostolic of the Upper Niger and the first Prefect-Apostolic was Fr. Jules Poirier, SMA. In 1911, the Prefecture of Western Nigeria was established with Fr. Carlo Zappa, SMA, as the Prefect-Apostolic. In 1918 Bishop Thomas Broderick, SMA succeeded Fr. Carlo Zappa (died in 1917) as Vicar Apostolic when the territory was raised to the status of a Vicariate. In 1934 Bishop Leo Hale Taylor, SMA was appointed Vicar Apostolic of Western Nigeria, succeeding Bishop Thomas Broderick who had died in 1933. Bishop Taylor was succeeded as Vicar Apostolic of Western Nigeria by our own Bishop P. J. Kelly, SMA. In 1943, the territory became known as the Vicariate of Asaba-Benin. In 1950, the Vicariate of Asaba-Benin became the Diocese of Benin City. Its first Bishop was Bishop Patrick Joseph Kelly, SMA. Bishop Kelly was succeeded in 1973 by our beloved brother and son now Archbishop Bishop Patrick Ebosele Ekpu. The Diocese celebrated its Centenary in 1984 and in 1994 it was elevated to the status of an Archdiocese. Archbishop Ekpu retired in November 2006 and Fr. James Mary Okunbor, V.G. was appointed Administrator of the Archdiocese. In 2007 Bishop Richard Anthony Burke, SPS (then Bishop of Warri) was appointed Archbishop of Benin City and he was installed in 2008. In 2010 Archbishop Burke resigned and on 31st May 2010, Bishop Anthony O. Gbuji (Bishop-Emeritus of Enugu) was appointed Apostolic Administrator of the Archdiocese of Benin City. On 28th April, 2011 Bishop Augustine Obiora Akubeze was installed as the Archbishop of the Metropolitan See of Benin. In 1955, the Kabba Prefecture was erected out of Benin City Diocese and entrusted to the Canadian Province of the Spiritan Congregation (C.S.Sp.) and led by Msgr. Auguste Delisle. In 1965 the Diocese of Lokoja was created with Bishop Delisle C.S.Sp. as its first Bishop. Bishop Delisle was succeeded in 1971 by Bishop Alexius Obabu Makozi, who was succeeded in 1992 by Bishop Joseph Sunday Ajomo. The current Bishop is Bishop Martin D. A. Olorunmolu. Lokoja is now in the Abuja Ecclesiastical Province. In 1964, the Diocese of Warri was created from the Diocese of Benin City and Bishop Lucas Olu Nwaezeapu was appointed its first Bishop. He was succeeded in 1991 by Bishop Edumund Fitzgibbon SPS. Bishop Richard Anthony Burke SPS succeeded him in 1997. Bishop Burke was installed as Archbishop of the Diocese of Benin City in 2008. Bishop John Oke Afareha was installed as the Bishop of Warri in 2010. In 1973, the Diocese of Issele-Uku was created from the Diocese of Benin City and Bishop Anthony O. Gbuji became its first Bishop. Bishop Gbuji was succeeded in 1990 by Bishop Emmanuel E. Otteh who was succeeded in 2004 by the current Bishop, Bishop Michael O. Elue. In 1991, the Apostolic Vicariate of Bomadi was carved out of the Dioceses of Warri and Port Harcourt and made a mission sui juris in 1992 with Msgr. Thomas Greenan SPS as the Ecclesiastical Superior. In 1997 Bishop Joseph O. Egerega was installed as first Bishop of Bomadi Vicariate. In 2008 Bishop Egerega was succeeded by Bishop Hyacinth O. Egbebo MSP (Missionaries of St Paul, a Nigerian missionary society). In 2002, the Diocese of Auchi was created from the Archdiocese of Benin and in 2003 Bishop Gabriel Godwin Ghieakhomo Dunia was installed as its first Bishop. In 2005, the Diocese of Uromi was formally created from the Archdiocese of Benin City. In 2006 the Diocese was canonically erected with Most Rev. Dr. Augustine Akubeze as its first bishop now the Archbishop of Benin City Province. The record of the SMA in Benin City Province may be crowned with some brief mention of Bishop Patrick Joseph Kelly SMA (1940 – 1973). We all remember him with deepest respect and joy. May his soul and the souls of all the faithful departed… rest in peace. Amen. Bishop Patrick Joseph Kelly SMA was appointed Bishop as successor to Bishop Taylor in 1940. His Episcopacy was a long one of thirty-three years, and a very fruitful one. There was progress on all fronts. Catechists were his top priority. He trained the catechists personally in his own compound. During the Confirmation visits he insisted on examining the candidates – thousands of them – himself. He was determined to build up the indigenous Church. In 1940 there were three indigenous priests; when he resigned in 1973 there were 50 and hundreds of Seminarians and Sisters. Likewise the number of Catholic Schools continued to multiply throughout the Diocese. (The Vicariate of Asaba-Benin became the Diocese of Benin City in 1950). He established the first Secondary Schools, Immaculate Conception College, Benin and St. Patrick’s, Asaba in the mid forties and he was the Proprietor of up to 75% of the secondary schools in 1972. But Bishop Kelly was above all a man of prayer. He was an SMA to the core and it was fitting that he should spend the latter years of his life at our Provincial Mother House in Cork City, Ireland. He died there on 18th August 1991, two weeks short of his 97th birthday. The Cause for his Canonization is underway in the Benin City Archdiocese. We hope that after this celebration the cause will receive a new and fresh impetus. In 1982 the Holy Father, Pope John Paul II came on a pastoral visit to Nigeria and proclaimed for the Church in the country a New Era of Evangelization. This must have sparked off a new zeal and courage in SMA mission thrust. Since 1983 new foundations have been made to ensure that the missionary work of the SMA to Africa and African peoples will continue. In 1986, a new chapter began for the SMA in Nigeria. With the local Church well established and with the challenge of Pope John Paul II to the Church in Nigeria to embark on a New Era of Evangelization, the time seemed right to invite Nigerians under the banner of the SMA, to go outside their own country, to preach the Gospel to parts of Africa where the Church is not as yet well established. From SMA records made available to us, fourteen Nigerian priests have been ordained (as SMA Fathers) and are working in a number of countries outside Nigeria. Those evangelized have now become evangelizers! May the Lord be praised both now and forever. 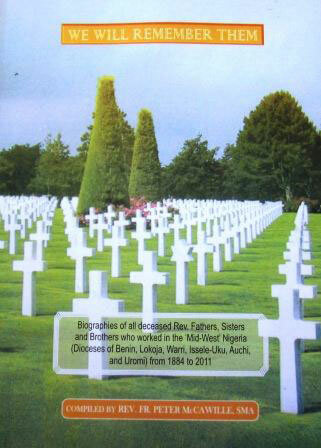 This is the title of the book containing the profiles of 425 deceased religious personnel who worked together with the SMA in the former Mid West region of Nigeria from 1884 – 2012. The Necrology of the SMA and the OLA record thousands of other missionaries who have paid, with the sacrifice of the lives, the great and precious price for love of God and neighbour. Many of the SMA missionaries are buried in countries scattered all over the mission lands, particularly in Nigeria. A pilgrimage to the cemetery in Asaba would be spiritually rewarding; and as you gaze on and wonder, please, offer up prayers to God, to grant eternal rest to the souls that lie there and await the glorious day of the resurrection. May their souls rest in peace. Amen. As we celebrate with joy and recount the numerous achievements of the SMA over the past 150 years of the arrival of the first missionaries in modern times to establish the Church in Nigeria we are filled with an over powering feeling of gratitude to God. He has in his infinite love and mercy worked in our land and in our lives great miracles; he has poured out upon us abundant blessings of faith, hope and charity. What shall we render to the Lord for the immeasurable gift of faith in Christ. This has proven to be the greatest gift God can give to his beloved children, for through faith in Christ we are destined to be coheirs with him of the eternal kingdom of our Father in heaven. With the grace of God and through the special intercession of so many holy and saintly SMA missionaries who have departed this life before us, we shall work hard and zealously to reach heaven. Dear SMA missionaries, living or dead: The Church in Nigeria today greets you and remembers you with immense gratitude. We ask the good Lord to bless and reward all the SMA missionaries to Nigeria and to the whole world. May God look kindly on the many thousands and millions of the SMA missionaries and all our people who have come to know, love and serve God and have since gone before us marked with the sign of faith. May God grant them also eternal rest in heaven. Amen. May this Mass of Thanksgiving which we all offer today with so much love and gratitude to God, open up a new spring-time of evangelization and mission for the Society of the African Missions. May the Blessed Virgin Mary the Mother of Jesus and Queen of the Apostles continue to protect and guide all SMA missionaries and the OLA Sisters, in the New Era of Evangelization. Amen.